The shortboard’s evolution in the ‘60s is basically attributable to one man, legendary Queenslander Bob McTavish. That great and garrulous character of Australian surfing, Bob McTavish, comes from the golden era of Australian surfing, when Midget Farrelly and Nat Young made Australia “the tops”, as was infamously announced by surfing journo John Witzig in 1966. Surfing movements can sometimes be like literary movements. They have their snobberies, their opinions as to what makes for a good surf, their own notions of selling out. McTavish came from an exciting time. Indeed, he had a great hand in making it exciting, when he popularised the vee-bottomed surfboard and virtually launched the shortboard revolution in 1967. Born in Mackay, Queensland in 1944, McTavish began surfing early on a 16-foot (4.8m) plywood paddleboard, immediately applying his nimble, ebullient intelligence to better surfboard design. He dropped out of school at 15, moved to Sydney and began shaping surfboards.Although McTavish was a top-level surfer himself, winning the Qld State titles in 1964-66, and finishing third in the Nationals behind Farrelly and Young, he shunned the world of competition at a relatively early age. McTavish and Young applied their talents to making such a surfboard early in 1966.Hence, “Magic Sam”. Sam was the thin, light longboard Young used to win the world championship that year. But McTavish, always curious, never really satisfied, devoted himself immediately to a new task: the invention – or at least the elaboration of – Young’s idea of the vee-bottom. This attempt to duplicate, on a stand-up board, the movement and thrust that the revolutionary Greenough was getting on his kneeboard began the shortboard revolution. McTavish had been toying with the idea of “short” ever since 1960, but had abandoned it until he saw Greenough in action. It started with a nine-footer: wide-tailed and with a deep “V” (or “vee”)-shaped “keel” throughout the back third of the board. As 1967 went on, the boards became smaller and lighter, each with the same vee-bottom principle. Eventually, the boards got down to 7’6” (229cm) and a mere 14 pounds (6.4kg) and their progressive reduction in length and volume meant an increase in speed, agility and time spent in the critical part of the wave. The Aussie surf movie The Hot Generation features McTavish and Young riding eight-foot waves at Maui on their vee-bottoms. This was the manifesto for the shortboard. For the first time, the world saw its possibilities. McTavish and others further refined surfboard design with pointy noses, concaves and vees, putting paid once and for all to traditional longboard surfing. Although many other shapers have since adopted boards better suited to the waves of Hawaii, no one has a better claim to effecting this shift in the way people rode a wave. In the 1970s, McTavish became a Jehovah’s Witness and dropped out of the surfing industry completely, but returned in 1989 with the introduction of his Pro Circuit boards, using modern technology to machine-mould replicas of the boards used by the top pros. Despite the failure of the business, the moulded board itself became a popular item. 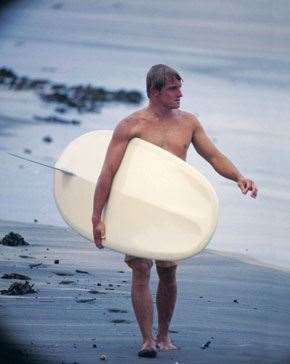 In 1992, McTavish was voted the most influential shaper of all time by Australia’s Surfing Life magazine and was later inducted into the surfing hall of fame.